I’ve been playing computer games for 30 years, and have always tried to keep up with the hardware required to run modern games. But I’ve never owned a “gaming” keyboard or mouse. Last year I purchased an HP Pavilian DV6 to use for gaming. Initially, I used the laptop keyboard and an external wireless mouse. Mostly ok, but the mouse had some accuracy issues. I then started to use the laptop with an external monitor, keyboard and mouse when in my office. Again, mostly ok, but now there was a problem with the PS2 style keyboard that I was using. Since it was the older PS2 style connector, an adapter was required to interface it to one of the USB ports. For general purpose data entry this is an acceptable solution. For gaming, not so much and here is the reason why: because of the USB adapter, multiple simultaneous key presses were not sent to the computer. What’s needed is a keyboard that supports n-key rollover. For the most part, USB keyboards support at least 2 key rollover, but again in the gaming realm, that might not be enough. The heart of any keyboard are the switches that complete the electrical circuit when depressed. There are two basic types: membrane and mechanical. The difference is that the membrane type key must be fully depressed to register a keystroke, whereas the mechanical switches only require partial depressing. Since only a partial keystroke is required, this will eliminate finger fatigue (all though I have never noticed a difference). The disadvantage to mechanical is the clicking sound it creates and the higher price. I wanted a USB keyboard that supports n-key rollover and has softer, quiet membrane switches. This lead me to the Logitech G510 gaming keyboard. There are 18 programmable keys on the left side, three different LED colors for the LCD and back-lit keys. Profiles for various games can be downloaded that will set the programmable keys for game specific functions (profiles are selectable via the LCD screen). On the right side of the keyboard are multimedia functions, a large mute button and a roller volume control. At first the roller seemed kind of gimmicky, but it really works great and is quite functional. Lastly, there is a slider switch to put the keyboard in desktop or gaming mode. The difference being in gaming mode the Windows and context menu keys are disabled (I don’t know how many times I’ve pressed the Windows key on accident in the middle of heated combat in Fallout). One of the interesting things about the keyboard is the LCD display. There are several included applets such as a clock, timer, RSS feed reader, POP mail checker, system monitor and profile selector. I have also found a piece of software that will allow the user to put just about anything on the display, with no programming required. It’s a free app called LCD Studio and works great with this keyboard. And if you are a WinAmp user, there is a lot of built-in functionality to support that software (visualizations, etc). It doesn’t appear to be maintained any longer, the last update was in 2007. But it still works great, and the price can’t be beat! In addition to a new keyboard, I also got a SteelSeries Sensei gaming mouse. Several benifits over a standard mouse, but first and foremost is the higher sensitivity measured in counts per inch, or CPI. The higher the number, the more sensitive/accurate the mouse is. This particular mouse has an ARM 32bit processor on-board that allows normal sensitivity of 5700 CPI, but can go as high as 11,400 CPI. The difference between a regular desktop mouse and this gaming mouse are night and day, especially noticeable in a first person shooter, but even when used in the normal desktop environment The mouse cursor movement is much smoother, especially on the diagonal. 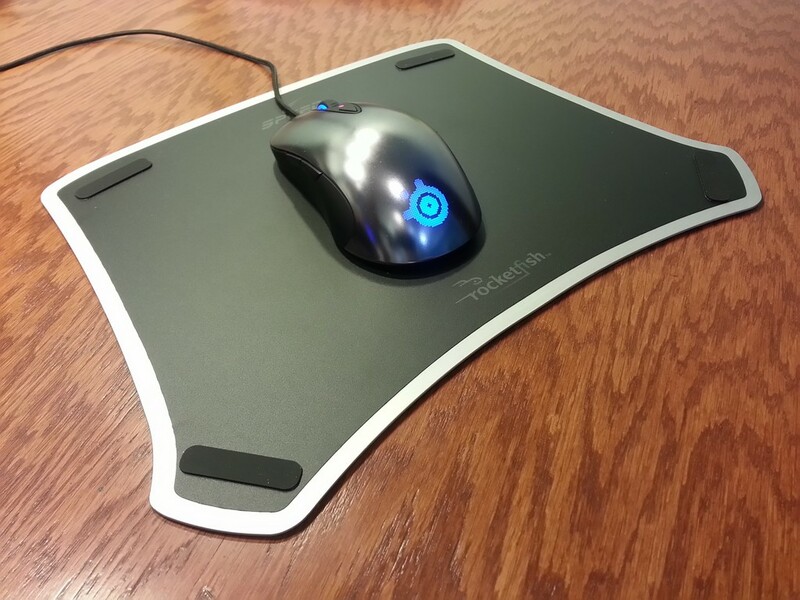 Coupled with a Rocketfish gaming mousepad, it glides across the surface with little resistance. Using the SteelEngine software that’s included, the colors can be change to an almost infinite number of combinations, and using the online tool, the LCD display on the bottom can also be changed to display a custom image. The LCD is also used to select different profiles, so the SteelEngine software does not have to be installed. The mouse firmware (yes, this mouse has firmware) can also be updated via the the same software interface. So, is a specific gaming keyboard and gaming mouse necessary? If you game on a PC, the answer is yes. Absolutely. But even if you don’t game on your PC, the average use would benifit from the Logitech’s macro programmable keys and multimedia functionality. The increased sensitivity of the mouse, the larger more comfortable size also would be noticeable improvement over a conventional mouse. The price for these might prohibitive to all but enthusiasts, however. Are you still using that keyboard? I am looking at getting a new keyboard myself and thought that one might be the ticket. I don’t using the LCD display or programmable keys that the 510 has, they’re cool features, but kind of gimmicky.